No, this post is not because Evie emancipated herself at six years old. It actually has nothing to do with humans. Instead, it has everything to do with the analogy: bird nests. I now realize how birds donated their fledgling graduation to our vernacular because of our recent experience with a happy house wren couple. One of the things our whole family enjoys is birds. Evie can already identify all the species that come to our house and her grandmother’s house in Huntsville. Kymberlee is our bird call expert, with her singer/songwriter ears closely attuned to the symphony of bird calls around us most mornings. I am the one who faithfully feeds them and defends them from the evil usurpers-of-bird-feed, squirrels. All three of us have hoped that, eventually, some of visitors would make our yard their home. This spring, we watched a cardinal couple build a nest deep into a holly tree. Twig by twig, we saw them build their home. Eventually, I got curious and went up ladder to check, and sure enough, there were three eggs. However, we didn’t see the parents very much and our fears became real when we found empty eggshells a few days later, probably victims of the usurpers-of-bird-eggs, squirrels. A few weeks later, over-zealous yard work uncovered a robin’s nest with eggs. Unfortunately, the lack of cover made it a victim to an egg robber. So it was a delight when, late in the season, we kept seeing a house wren checking out one of our bird houses hanging on the front porch. House wrens do not typically eat bird food, so they only visit yard to nest or find insects to eat. We are, like most house birders, proud to complete the house bird trifecta – house sparrow, house finch, and now house wren. We had actually seen this wren last fall, darting in and out of the hole but having no idea why they would be nesting in the fall. It took us a while to identify it because it was so fast coming in and out. The mama, or so we assume, started building the nest. We’d check it out from time to time, glimpsing the buildup of twigs and feathers that would hopefully become home for some baby birds. We found that, like most birds, mama wren was very protective of her house. Attempts to look in were followed by a flurry of feathers that scared the living daylights out of you if you were unprepared. So we never really saw the eggs but knew from the dedication that mama was sitting on something valuable. The eggs hatched around June 24th. I know this for two reasons – I started hearing the calls and kept watching the mama (and daddy) bring an amazing amount of insects to the house. I took one blurry picture of them on the 27th. You can only see one, but later we were able to see four baby birds in this small house. The day before, I took this video to send to Kymberlee, then in California, so she could here the baby birds. Like all babies. they got bigger. And louder. The parents continued their incredible delivery service, and it was pure entertainment watching them from one of our couches. Flash forward 14 days. The noise had been decreasing, but our nighttime checks still revealed that the babies were still in the nest. Then one morning, there was quite a commotion when I came out the door in the morning. Later that day, the check revealed that the birds were gone. The commotion was simply the act of getting the babies fledged and out of the nest. Strangely, I felt a loss. I love the fact that humans can feel empathy with almost any living creature. The wrens, by their choice of nesting site, had become a part of my family. And now I am an empty nester. The birdhouse doesn’t sway anymore with the darting off of the parents when I come out of the front door. I don’t hear their calls from the nearby bushes or trees. I don’t see all the insects being delivered. 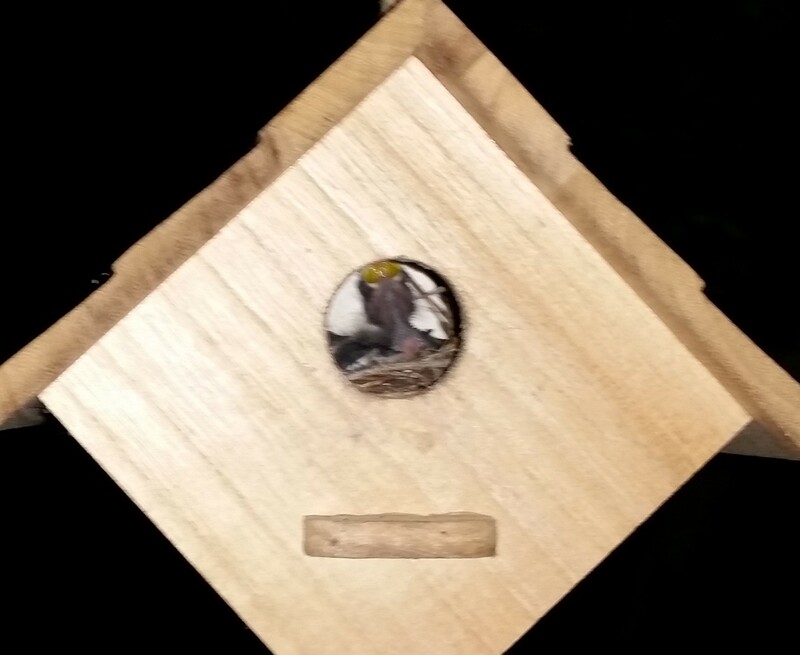 I am now a bird baby empty nester. If this is how I feel when baby birds leave, I am definitely in trouble when Evie leaves. Maybe the empty-nester birds will teach me to appreciate my full nest more.